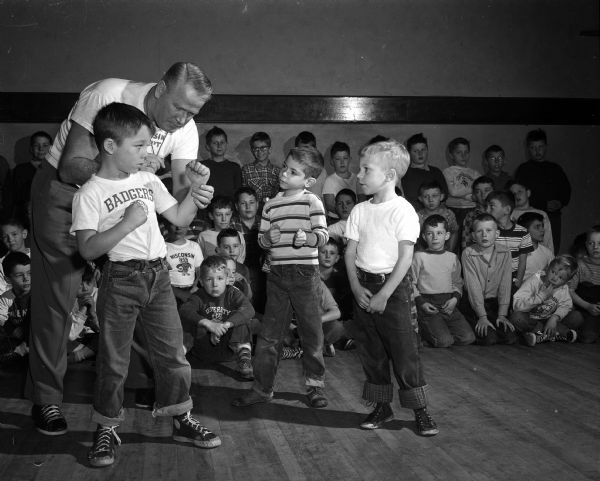 Vern Woodward, University of Wisconsin assistant boxing coach, helps young students during a "Little Boxers" class at the Eagles Club, 23 West Doty Street. Woodward helps Ronnie Eservig take the proper boxing stance while Ricky Raznikov, center, and Tommy Wagner, right, watch. Published in Wisconsin State Journal December 27, 1952.